Wedding season is fast approaching and many couples want their beloved four-legged companions to be part of the festivities. Planning ahead is the key to incorporating your canine in the celebration and will help preclude any mishaps on your big day. Take into account the following factors when deciding if their presence will be a help or hinderance for either you or your pet. Consider hiring a dog handler. If you’re concerned about the logistics of having your dog at your wedding, let Bark + Boarding be your dog’s personal assistant for the day! 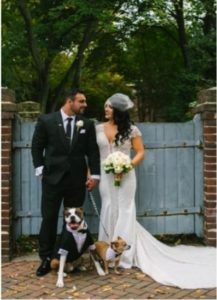 Miranda Namrow of Arlington hired Bark + Boarding to dress, transport and handle her dogs Boz and Kobe at her October wedding to husband Mitch. Will your dog be comfortable? Big gatherings such as weddings can be scary and overwhelming for a dog that does not adapt well to new environments or is uncomfortable around strangers. If your dog is fearful or shy around people, it’s best to leave her at home where she’ll be able to relax in the comfort of familiar surroundings. Check the location. Does your wedding venue allow dogs? Be sure to ask if your dog will be allowed in all areas or if there are certain areas that will be off-limits. Imagine the stress and disappointment if you’ve planned on having your dog walk the rings down the aisle only to discover ten minutes beforehand that she’s not allowed in the ceremony area. The Namrows were married in a church in Old Town Alexandria, that did not permit dogs inside. They opted instead to include Boz and Kobe in several wedding photos taken on the grounds of the church. Let everyone know. Inform your wedding party, guests and photographer well in advance of the event that your dog will be present. Not only is this common courtesy, but you want to provide people with pet allergies ample opportunity to prepare. Practice makes perfect. Rehearse as much as you can with your dog before the big day and allow extra time to practice during the rehearsal so that she knows exactly what to do and when to do it. Ensure that your dog is well-controlled around your guests. If your dog has a tendency to jump on people, teach her an alternative behavior such as greeting a person by sitting and offering her paw. Most importantly, enjoy your big day and have fun!